Cascade Koi & Aquatics are renowned for being one of the largest retail sellers of The Nexus Eazy 220 filtration systems. They provide significantly improved degrees of clearness for fish ponds. 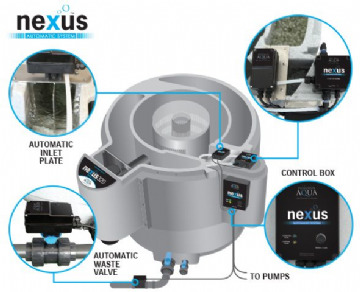 Structure on the success of the award winning Nexus array this new generation of filters smartly integrate mechanical as well as biological filtering right into one advanced filter system, whilst being exceptionally very easy to clean and also basic to install. The Nexus 220 includes a re-designed Eazy filter which now uses the all new K1 Micro filter media, in a fixed bed, to provide improved levels of mechanical purification. The Nexus filter systems additionally utilize the acclaimed K1 Media in the relocating bed to deliver superior levels of biological filtration. With each other this mix of filter media work to deliver crystal clear and also healthy water. All Nexus filtering systems can be set up on pump fed or gravity fed setups depending upon your fish pond setup. 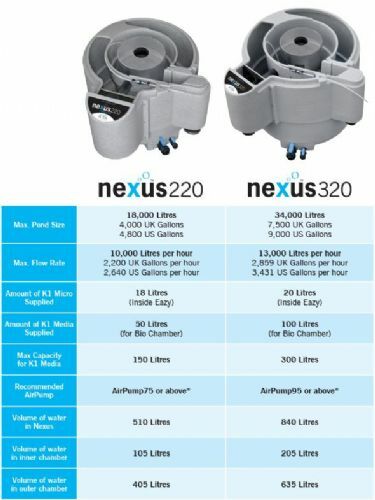 The Nexus 220 appropriates for fish ponds up to 18,000 litres (4,000 gallons) while for larger ponds the Nexus 320 can be set up on fish ponds as much as 34,000 litres (7,500 gallons). Water from the fish pond enters the nexus via the inlet into the inner chamber which functions as a vortex enabling larger solids to resolve out. Water then goes through the grills in the stainless-steel Eazy filter, where the finer fragments are gotten rid of at the mechanical phase of purification, thanks to the static bed of our award winning K1 Micro filter media. The mechanically clean water then passes to the outside chamber of the nexus where the K1 Media moving bed lies for organic therapy before being gone back to the fish pond. At this stage, organic break down takes place with various pressures of microorganisms and filter feeders residing on the protected area of each item of the K1 Media. These germs transform Ammonia as well as Nitrite into safe Nitrate. Water then goes through the leave grill right into the electrical outlet, returning back to the pond. The Eazy is a stainless-steel vessel having a set quantity of K1 Micro Media (20 litres in the Nexus 320 as well as 18 litres in the Nexus 220) which lies within the inner chamber of the Nexus. After water gets in the Nexus it turns around the Eazy in the internal chamber with a down motion allowing the bigger solids to resolve to the bottom of the chamber before passing through the slots of the Eazy right into the static K1 Micro. The water streams from all angles with the K1 Micro where enhanced mechanical filtration and negotiation occurs and also great particles are captured within the K1 Micro. The water after that flows via the slots in the centre column as well as right into the outer chamber. The outer chamber of the Nexus consists of the moving bed of K1 Media. 100 litres of K1 Media is supplied with the Nexus 320 with the choice to add an additional 200 litres of K1 Media ought to it be required. The Nexus 220 is provided with 50 litres of K1 Media, with the choice to add an added 100 litres of K1 Media if needed. This permits the biological capability of your filter to expand with your fish. The outer chamber is where the last of organic treatment takes place. Organic malfunction takes place with various stress of germs surviving on the protected surface area on each piece of the K1 Media. These bacteria transform Ammonia and also Nitrite right into harmless Nitrate. The amount of Ammonia as well as Nitrite generated in the fish pond is dependent on feed prices as well as the kind of food made use of. For higher feed prices extra K1 Media should be included into the external chamber. You could enhance the biological capability of your Nexus by including added K1 Media right into the external chamber. 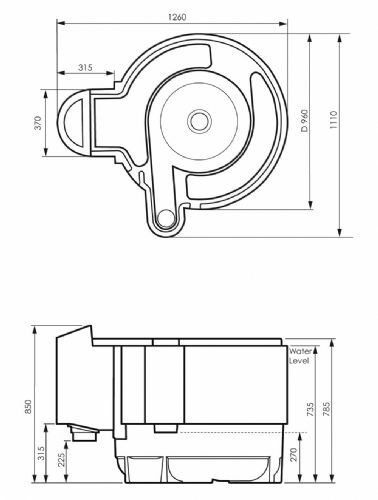 You will nevertheless should make sure that you have the correct size of air pump to make it possible for the K1 Media to relocate completely (see table for suggested size of air pump). 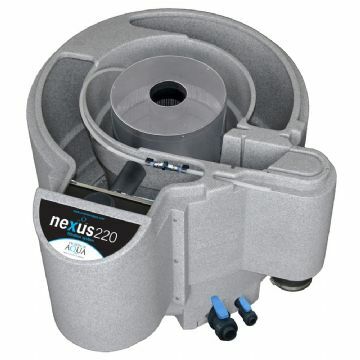 For Nexus filtration systems straight out of the box without additional media added, we advise an Air Pump 75 to power the relocating bed in a Nexus 220 as well as an Air Pump 95 for a Nexus 320. Nexus purification systems can be installed on PUMP FED or GRAVITY FED set-ups. In all situations the Nexus MUST be set up on a strong, level base, a minimum of 1.2 metres x 1 metre. By this we indicate that if your pump is most likely to be made use of to provide the water to the filter, and the filtered water after that returns back into your pond via gravity, i.e. down a waterfall, or via a large size pipe, this is referred to as PUMP FED (i.e. the water is fed to the filter using a pump). By this we imply that your pump is going to be utilized to return the filtered water to the fish pond and also therefore your filter will be supplied by gravity via a bigger size pipeline. In this situation the water level in the filter will certainly go to the very same degree as the fish pond.